Mercury Signs are connected to communication, reasoning, intellect and awareness. Due to its affect on brain power, Mercury will show short term planning, observation and deductive reasoning abilities. 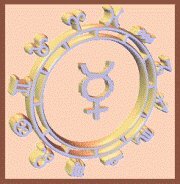 Unemotional and curious; Mercury looks for opportunity to act. It inspires ideas, thought processes and the unconscious mind, which all must be coordinated. Analytical ability, sorting and grouping and other methods of making sense of things all come from this planet. Mercury expresses thoughts effectively to others depending on how this planet is represented in the birth chart. The senses are also in this planets domain, and that is why we learn so well using our senses. Mercury is willing to charge into the unknown, and in the process, may be able to learn something more than his more timid peers. Many detectives, spies and other daring seekers of knowledge have a prominent Mercury; while some with a negative aspect may resort to intellectual trickery to get ahead. Your Mercury Sign may indicate whether you enjoy large groups of friends around you and if youre fond of children. It may also show your love of books and writing, and if you enjoy putting pen to paper. Natural study habits are also bestowed by Mercury. If study comes hard, your Mercury Sign may not be found in a positive aspect. While you can learn better study habits, you may find out that no matter what you do, they will always be a chore. However, this planet is nothing if not adaptive. It can appreciate the oppositions viewpoint, and due to this ability, often gets what it wants using the art of diplomacy. It has a great knack for problem solving and with its short rotation around the sun, is known for its quick thinking, quick wit and brilliance. Look for this glyph (symbol) on your birth chart and note the Zodiac Sign its in. Once youve done this come back and read the interpretation below.